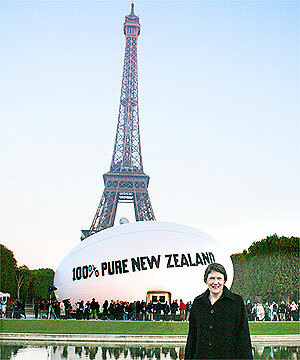 The Prime Minister yesterday officially opened Tourism New Zealand’s giant walk-in rugby ball, situated in front of the Eiffel tower in the Champs de Mars. The interior of the 25 metre long, 12 metre high ball is built to showcase New Zealand – with video projected on the internal surfaces. The ball structure is inflatable and holds up to 220 people. In the day time, the venue will be open to the public, promoting New Zealand tourism, businesses, culture, lifestyle, food and wine, and technology. In the evenings, it’ll become the venue for New Zealand-hosted trade and industry events, exhibitions, big screen viewing, functions and meetings. The ball will stay in its current spot for three weeks before beginning a tour of its own as a promotional vehicle for the Rugby World Cup to be held here in 2011. Here’s a link to a short video of how it was made. And good luck to the All Blacks! Who’s the rugby fanatic standing in front of the ball. Did she peel rubber getting to this game on time?